Labour Party conference 2018 will be remembered for being the point at which the Labour Party nailed its colours to the mast on Brexit. Put simply, we are now committed to membership of a customs union, to full participation in the single market, and to vote down any government deal that risks the return of a hard border on the island of Ireland. This puts Labour policy now somewhere between Norway and Remain – a clear indicator of the direction of travel inside the shadow cabinet and leader’s office. To achieve these ends, Labour will reject any Tory deal that fails to meet Keir Starmer’s six tests and the red lines set out in Jeremy Corbyn’s leader’s speech. Should the government deal fall, Labour will quite rightly call for a general election, arguing that Theresa May has failed at the most important task facing the nation and should be replaced. If a general election is not possible, the party will pursue other options – including, crucially, a public vote on the Tory deal possibly with an option to remain. Clearly the leader’s office and Starmer have responded to the increasing likelihood of a car crash no deal or bad deal, but the party’s new stance is just as much the product of grassroots decision making and activism. This is party democracy in action. The story of summer 2018 has been the mass effort by pro-democracy campaign groups Labour for a People’s Vote, Another Europe, Remain Labour and For Our Future’s Sake, all of which have rallied CLPs and party members from every faction to call for a public vote on the Brexit deal. Comparable efforts have been made in many of the trade unions, with GMB and TSSA in particular leading the charge to get the unions and TUC behind a public vote. The result – a record number of CLP motions sent to party conference on a single issue, a YouGov poll on the eve of conference showing that 86% of party members back a public vote on the deal, and a six-hour Brexit composite meeting that ensured the final text did not exclude remain as an option. It effectively commits the party to Norway as a minimum, and that puts a public vote front and centre if a general election is not forthcoming in the autumn and – as seems likely – May’s deal is voted down. Two days later, Starmer said remain on the ballot would be kept open as an option, earning a standing ovation and suddenly creating the impression that the Labour Party is up for the fight to preserve Britain’s place in Europe. It feels like a marker has been crossed. Corbyn’s speech committed the party to vote down Chequers unless the government meet strict criteria, which the government has immediately rejected. His trip to Brussels immediately after conference looked like a statement of intent, as did his statement that no deal would be a ‘national disaster’ and ‘damaging to jobs and living standards’, to be avoided at all costs. Without Labour support, a public vote on the Brexit deal is impossible – only Labour in parliament can oppose the government and make clear the damage the Tory deal or no deal would do to the country. Only Labour, with the backing of third parties and a few Tory rebels, can get us a democratic public vote on the Brexit deal. The final piece of the picture is public opinion – and only Labour has the campaign experience and active membership to shift it. Given the increasing understanding we have of the negative impacts of a Tory bad deal or no deal, the messaging we need is becoming clear. The Brexit on offer is so far from that promised in 2016. Those of us campaigning for a public vote must continue to work with the Labour leadership and trade unions to ensure that commitment becomes reality. We need too to massively increase our public facing work to explain the impacts of a bad Tory Brexit on working class communities. Public awareness is still far too low – a confused Brexit debate, too focused on trade deals and Tory infighting, instead of clearly explaining the real world impacts of a Tory Brexit, has left the public ill informed. The solution is the Labour doorstep. We have the biggest ground game in the country. We can use it to explain the disaster that Tory Brexit would be for working-class communities and make the case for a public vote. The answer to working-class communities’ problems is a radical Labour government. A ground campaign for a public vote on Brexit and the case for Labour’s radical programme can go hand in hand. At Labour for a People’s Vote, we are massively increasing ground campaign, working with comrades in the unions and Hope Not Hate. 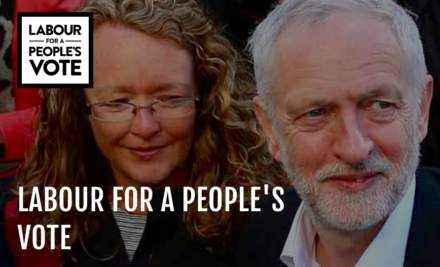 To get involved, sign up here or join the team as a CLP rep here. We can stop Tory Brexit and take a huge step towards winning a radical Labour government.